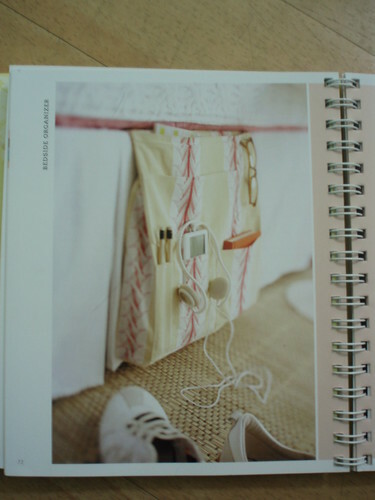 I’m working on an Amy Butler pattern from In Stitches for a bedside organizer. Since Joe and I have the least amount of furniture allowable by law including no bedside tables we end up with a pile of items on the floor beside our bed. I bought In Stitches a few months ago and haven’t made much from it although I look through it religiously. I made the placemats and napkins for a friend as a wedding gift but haven’t attempted any of the other projects. I’m using this beautiful fabric that I thrifted a while back. It was almost hard to cut up but I was also itching to use it because it broke my heart to keep looking at it in my stash pile. 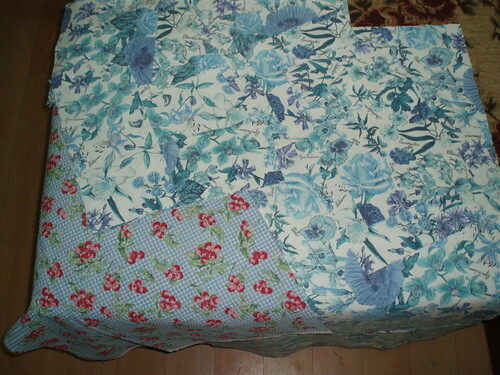 It’s former life was that of a vintage tablecloth. 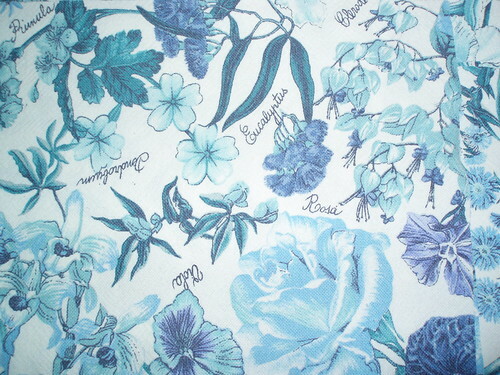 The blues are sweet and I love the latin names of the flowers. The fabric is soft from years of washing and I can’t wait to see how it turns out. This is a picture of all of the pieces cut out and ready to be sewn together. The cherry seersucker fabric is being used as the deck to go between the mattress and boxspring even though here in Korea they don’t believe in box springs. The pattern called for plain canvas for the deck but I have none and since I am working from my stash the cherries will have to do. I want to make one of these. I think my husband can benefit from one – then he’ll know where his glasses are in the morning! Did you know there an AB In Stitches-along going on?